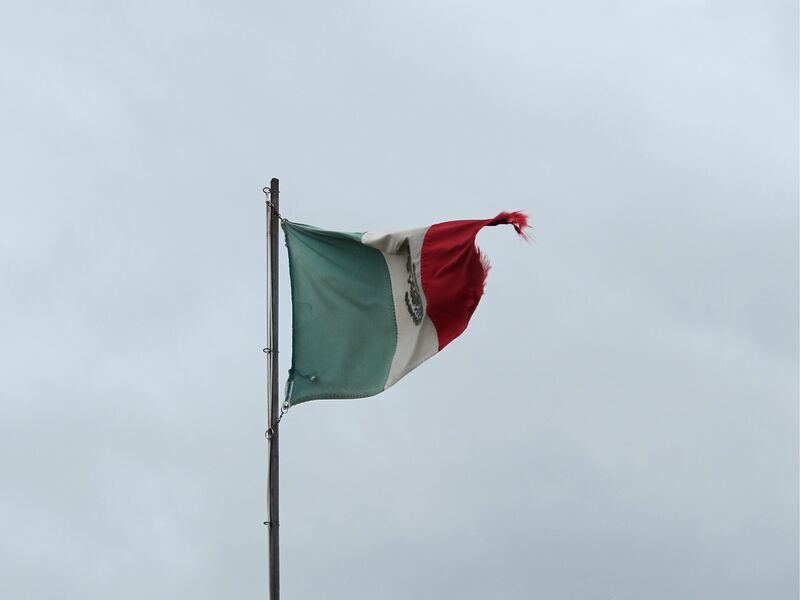 At 11 PM tonight, with El Grito de Dolores, also known as El Grito de la Independencia (the Shout of Independence), echoing from government buildings throughout the country, Mexico begins celebrating her long and hard-fought independence from Spain. 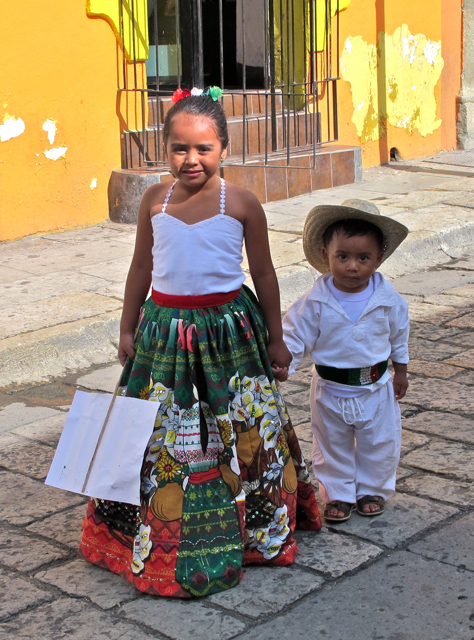 Despite the gathering of meteorological and political storm clouds, Oaxaca has gotten her green, white, and red on. This proud yet faded flag with frayed edges seems a fitting symbol this year. As I write, it is late on September 15, and all over Mexico El Grito de Dolores, also known as El Grito de la Independencia (the Shout of Independence), is echoing from government buildings throughout the country, from the Palacio Nacional in Mexico City to Oaxaca’s Palacio de Gobierno to ayuntamientos (city halls) in small towns. 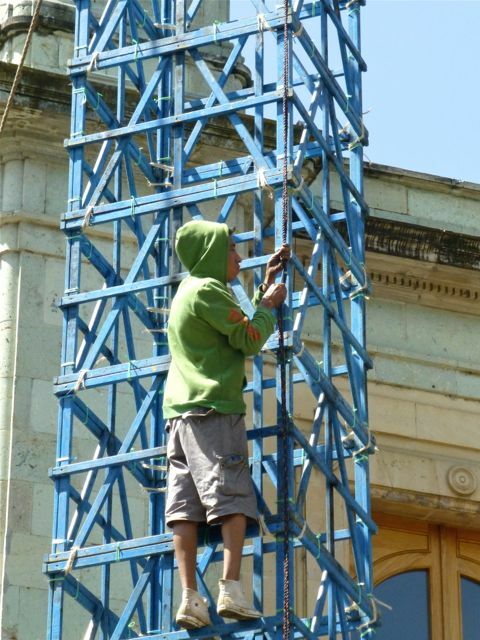 Portraits of the above listed heroes of Mexico’s War of Independence from Spain hang from the Government Palace in Oaxaca, as well as from the Municipal Building facing the Plaza de la Danza. And, this year, José María Morelos y Pavón is honored with a second massive portrait on the outer wall of the Municipal Building. 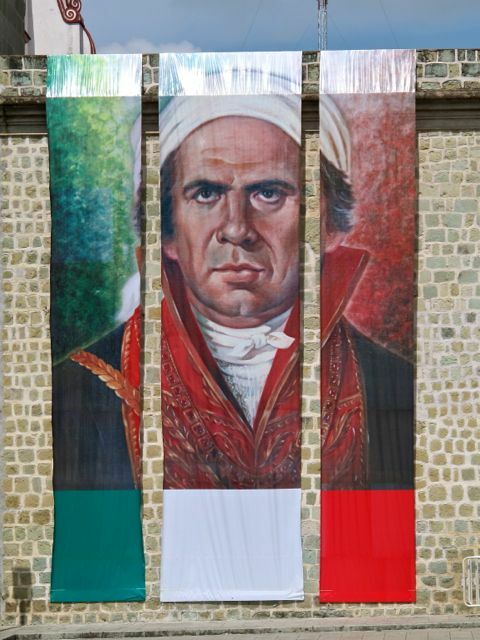 Last year, it was a reproduction of Orozco’s dramatic painting of Miguel Hidalgo y Costilla. 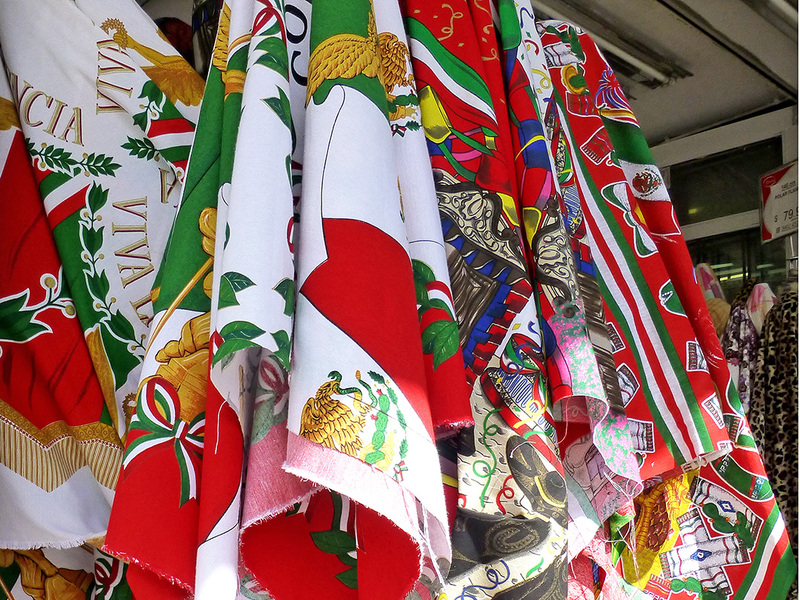 El Grito not only heralds green, white, and red decorations, clothing, and Mexican flags. It is also the season to savor the multi-layered, delicate flavors of Chiles en Nogada and delight in its colorful, patriotic presentation. 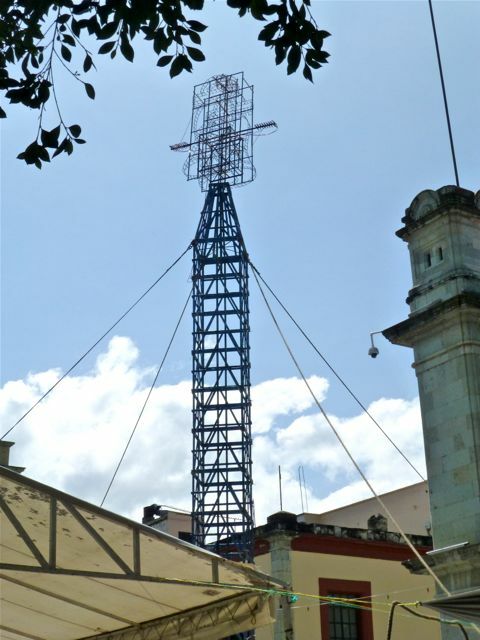 Legend has it, the dish was created in 1821 by nuns in Puebla to honor a visit by Mexican General Augustín de Iturbide, that pretty much signaled the end of the eleven-year long Mexican War of Independence. 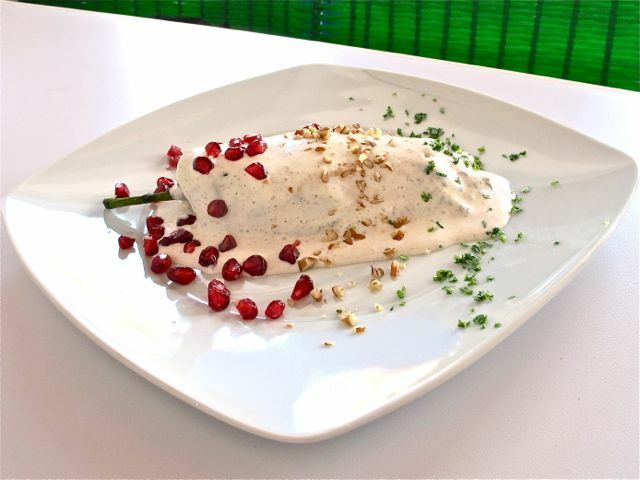 There are probably as many recipes for Chiles en Nogada as there are chefs and abuelas, but the basics include green poblano chiles stuffed with a picadillo of meats, fruits, nuts, herbs and spices; served with a creamy white cheese and walnut sauce; and topped with a garnish of red pomegranate seeds, walnuts, and the green of chopped parsley. This was my lunch of Chiles en Nogada today at La Popular, a delightful new restaurant in Oaxaca (Garcia Vigil 519, Centro). Yummm…. (ps) Chris just posted this video of Lina Fernandez making Chiles en Nogada. She makes it look almost doable! 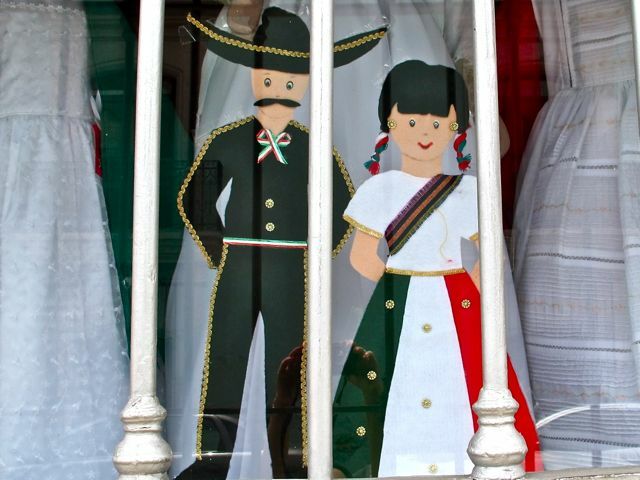 Couldn’t resist just one more El Grito window display! 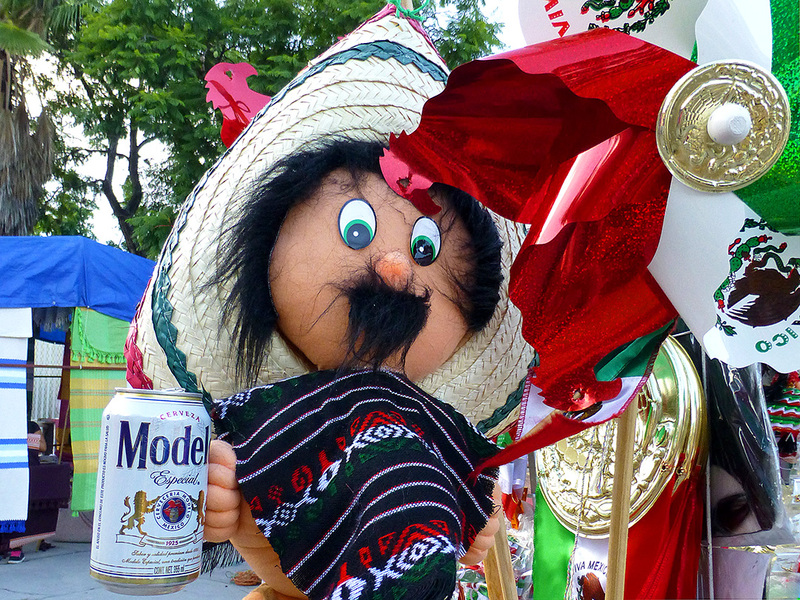 Where else have you seen El Grito decorations? Schools, of course! 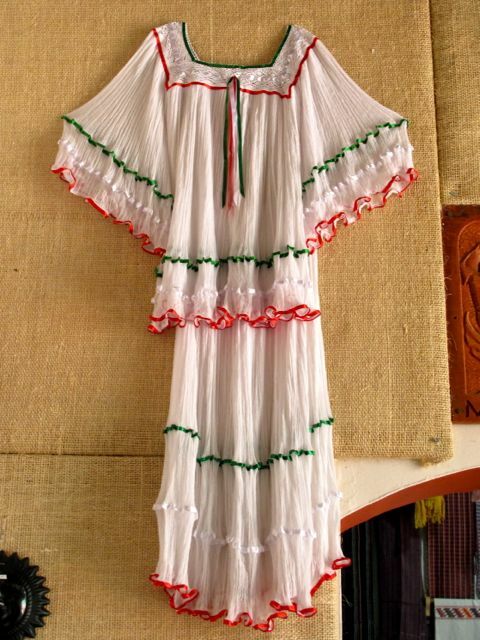 This one in Teotitlán del Valle. 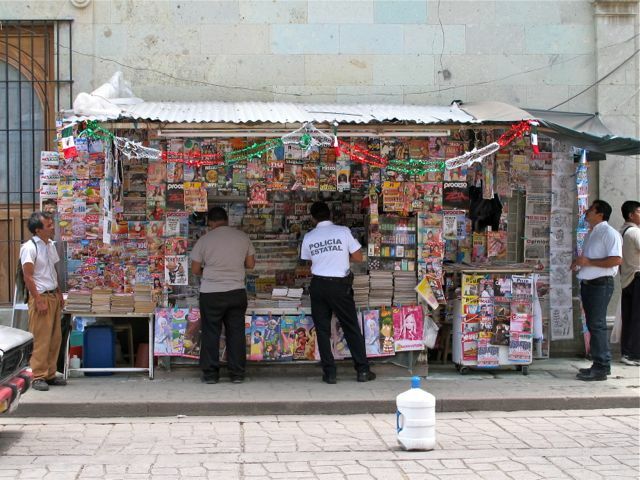 And, how about newsstands? 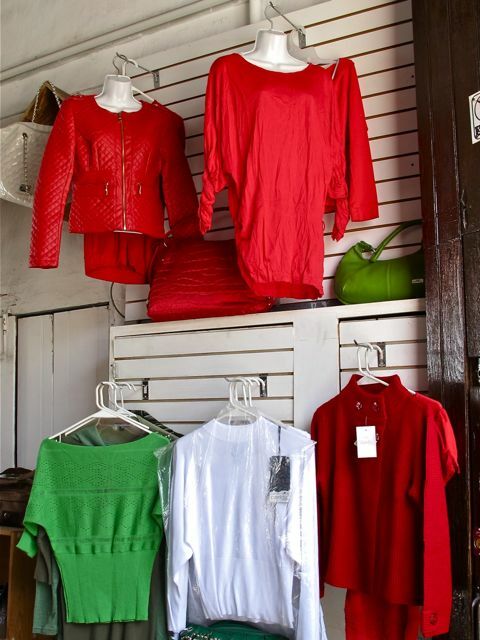 You can’t miss the green, white, and red — it’s everywhere! Have you got your colors on? El Grito is coming, El Grito is coming!!! 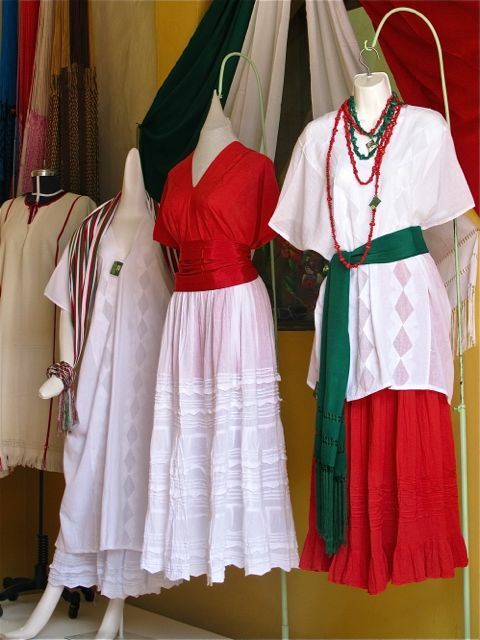 Green, white and red is on display all over the city, including clothing stores, as tradition calls for wearing the colors. Are you in the market for a traditional look? Or, are you leaning toward an updated mix and match style? 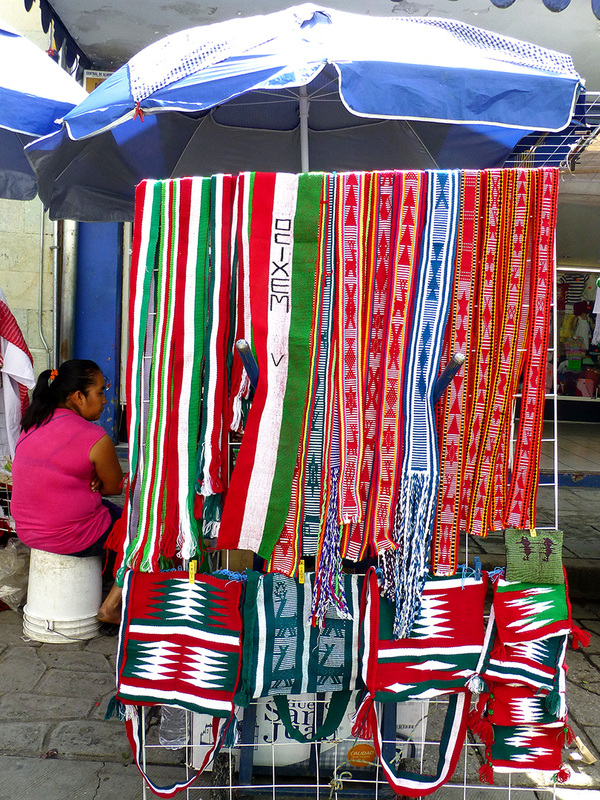 Do you need a sweater for going down to the zócalo on the evening of September 15? 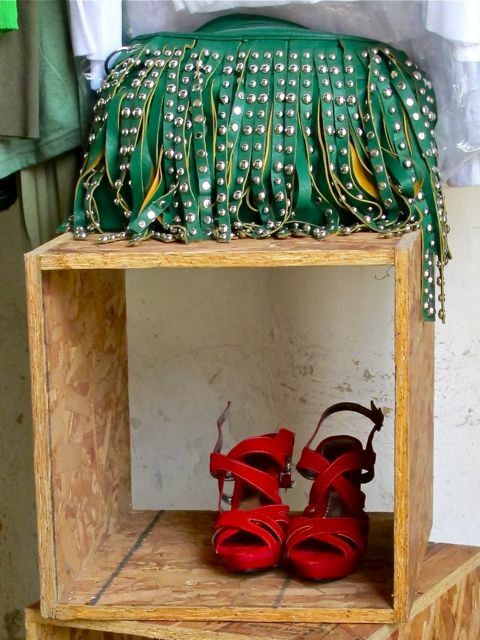 By all means, don’t forget to accessorize! 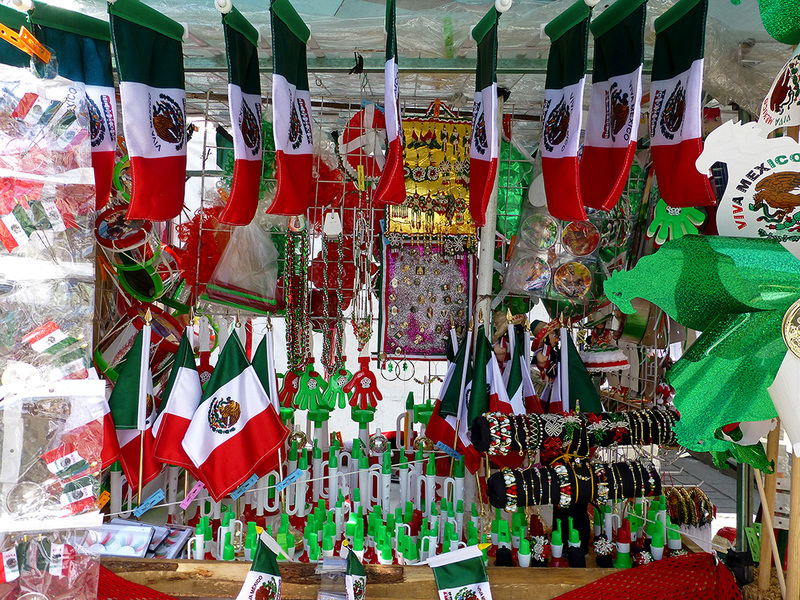 On a more serious note: Despite its current challenges (which are many and serious), Mexicans are extremely proud of being Mexicanos. And, in my humble opinion, they have every right be! 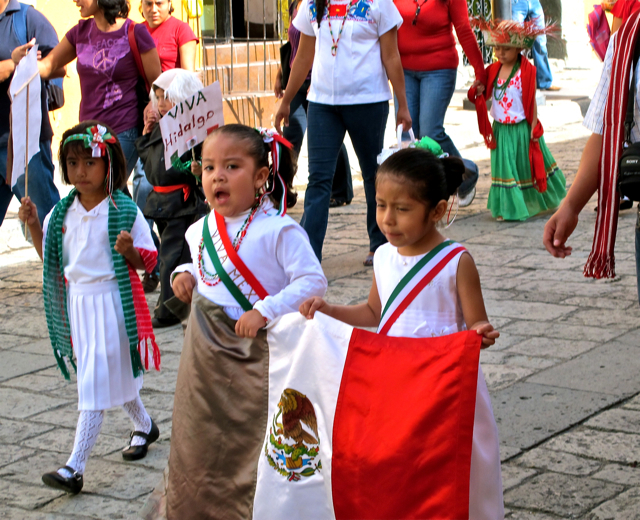 They can trace their history back to ancient and highly developed civilizations, their national cuisine has been placed on the World Heritage List by UNESCO, and Mexico is considered one of the most geographically and biologically diverse countries in the world. 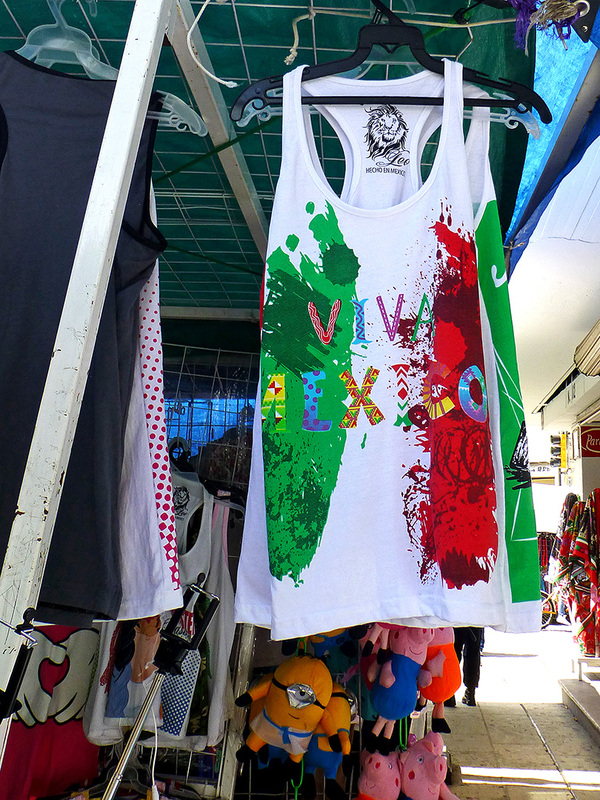 Plus, when was the last time you heard Mexico had invaded another country? 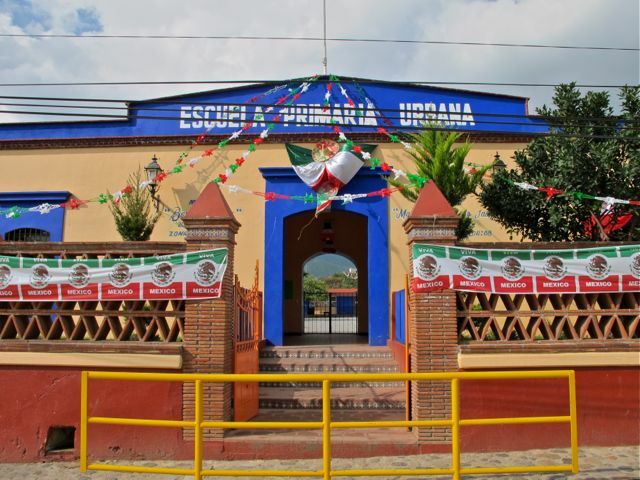 …the insurgents vacillated between Independence (Morelos) and modern forms of autonomy (Hidalgo). 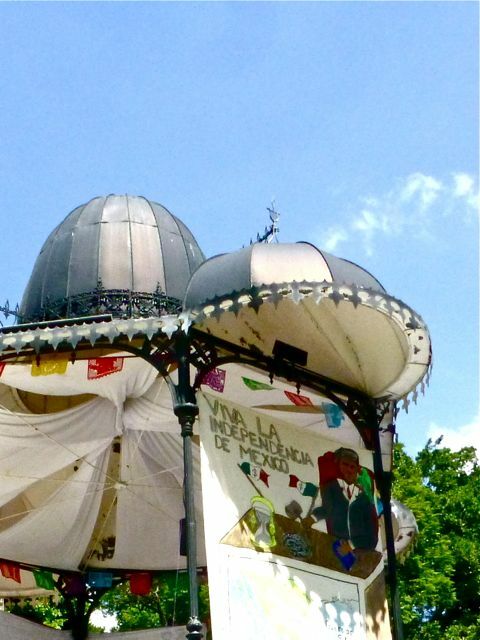 The war began as a protest against the abuses of the metropolis and the Spanish bureaucracy, but it was also, and primarily, a protest against the great native landholders. It was not a rebellion of the local aristocracy against the metropolis but of the people against the former. 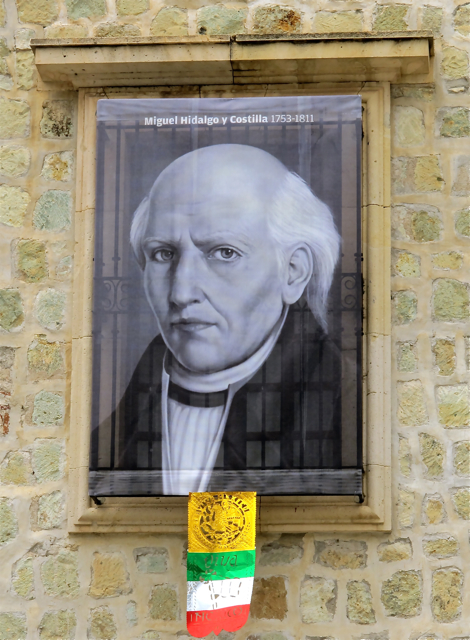 Therefore the revolutionaries gave greater importance to certain social reforms than to Independence itself: Hidalgo proclaimed the abolition of slavery and Morelos broke up the great estates. 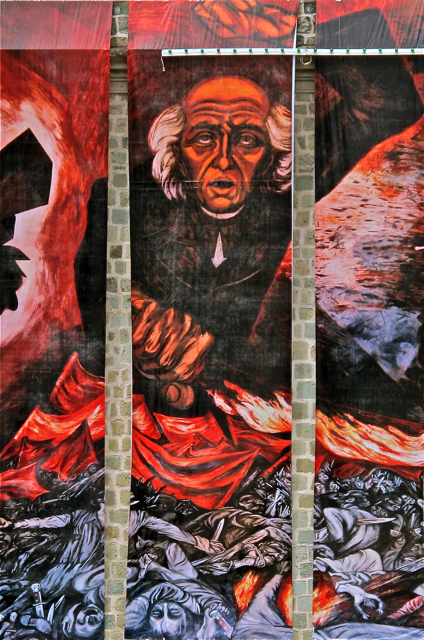 Banner on Oaxaca's Municipal Building; reproduction of mural by José Clemente Orozco of Miguel Hidalgo y Costilla. These two were bringing up the rear because they kept pausing for photos, and I couldn’t resist, either! 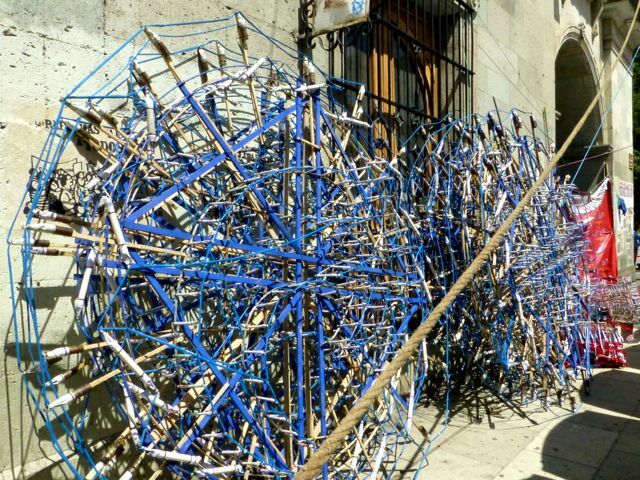 Going to the zócalo this afternoon more resembled trying to get to an airport gate, than strolling into a town square. Security checkpoints, with metal detectors, have been set up at 10 intersections. According to an article in this morning’s Noticias, security cameras are also in use. 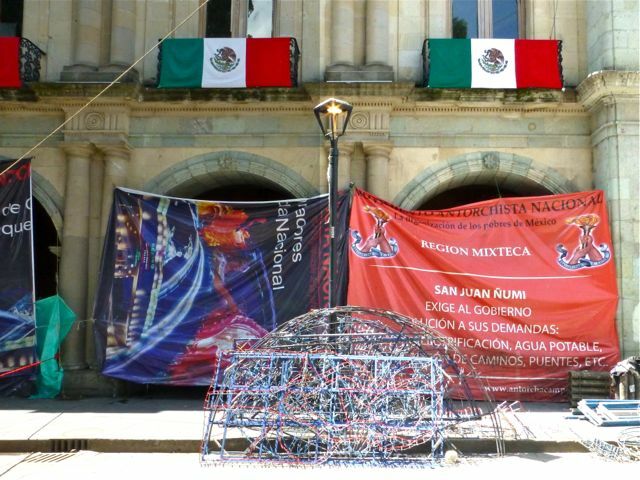 All is in readiness for tonight’s festivities… another sound and light show projected on the cathedral, fireworks, and the Grito de Dolores from the balcony of the Government Palace. 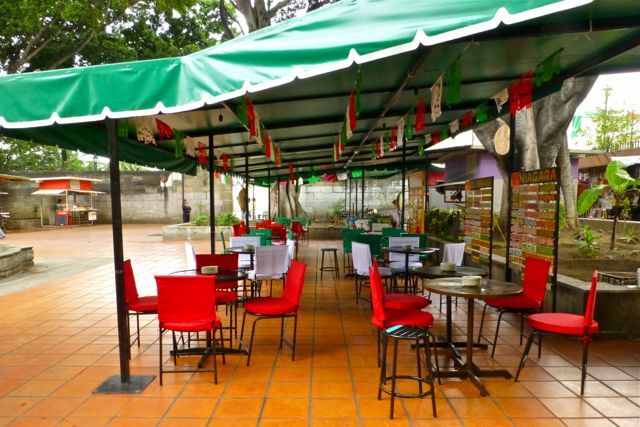 However, tonight I’ll be eating the traditional Chiles en Nogada, listening for the bells at 11PM, and then watching the fireworks from my ringside seat on the rooftop. 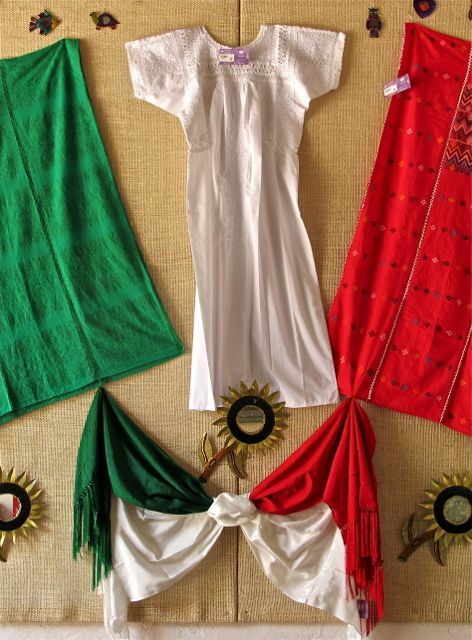 ¡Viva Mexico! (ps) Portrait on the left is of Vicente Guerrero. 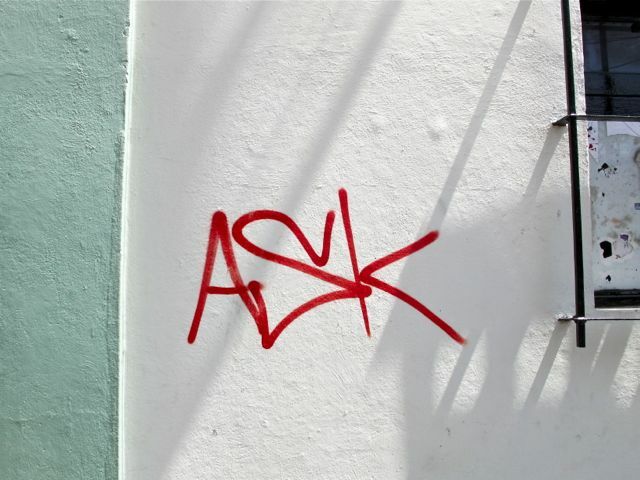 In Mexico, from small pueblos (villages) to large ciudades (cities), most all have calles (streets) named Morelos and Hidalgo — some, like Oaxaca, have more than one, which can be very confusing when trying to find an address, to say the least! The names Vicario and Ortiz de Domínguez aren’t nearly so commonplace. 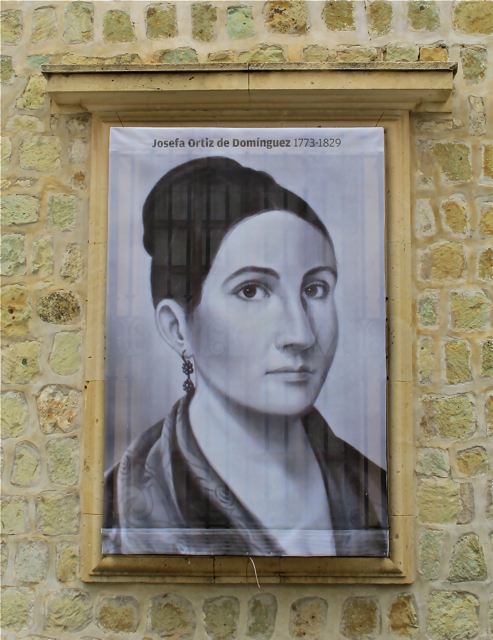 However, two of the women (among countless unsung heroines) who played a major role in the struggle for independence from Spain were Leona Vicario and Josefa Ortiz Domínguez. 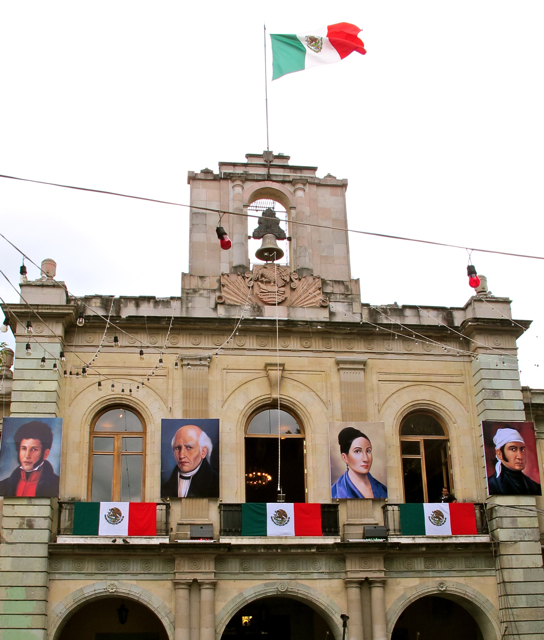 In a fitting tribute to their importance to the Independence movement, their giant portraits currently hang on the outside wall of the Municipal Building overlooking the Plaza de la Danza, along with those of Miguel Hidalgo de Costilla and José María Morelos y Pavón. Leona Vicario provided money and medical support, helped fugitives, and served as a messenger. After escaping from prison, she helped her husband, Andrés Quintana Roo, plan strategies on the battle field. 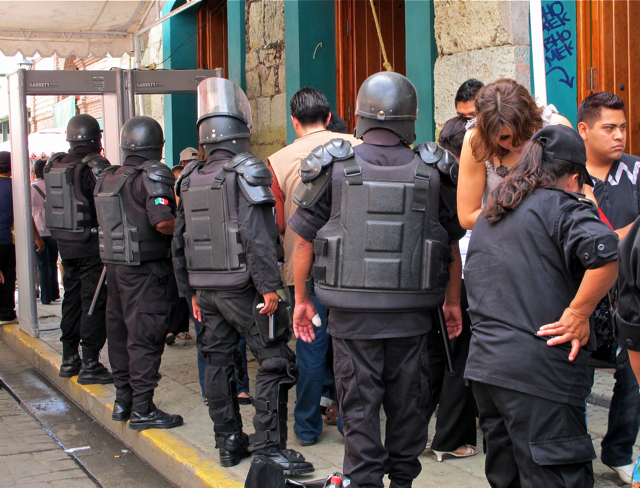 Confined to house arrest after a co-conspirator betrayed the upcoming plans for revolt by the Independence movement, Josefa Ortiz de Domínguez was able to smuggle a message out, warning of the betrayal. 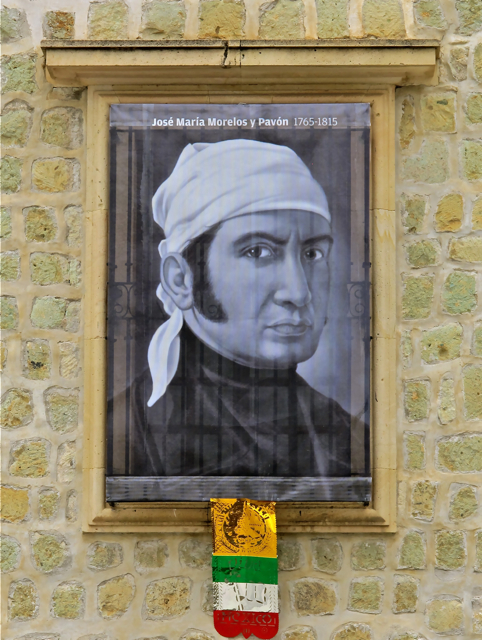 The last portrait on the wall is that of José María Morelos y Pavón, of Afro-mestizo heritage, and, like Hidalgo, also a priest. He was a capable military commander who assumed leadership of the independence movement after Hidalgo was executed. 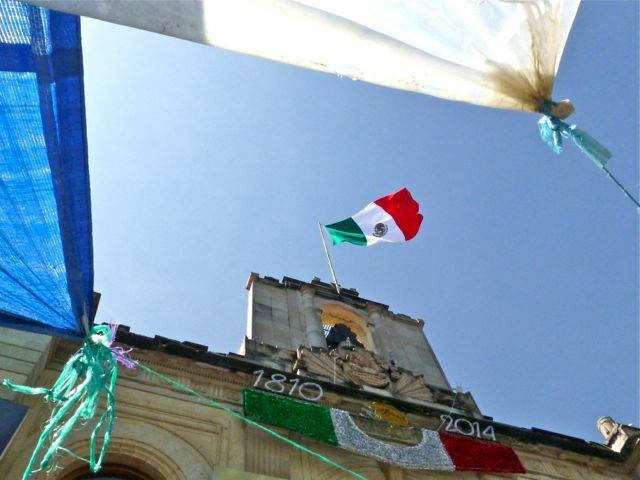 For a local connection, on November 25, 1812, in what is thought of as a brilliant victory, Morelos, along with the support of Mariano Matamoros and Miguel Bravo, took the city of Oaxaca. 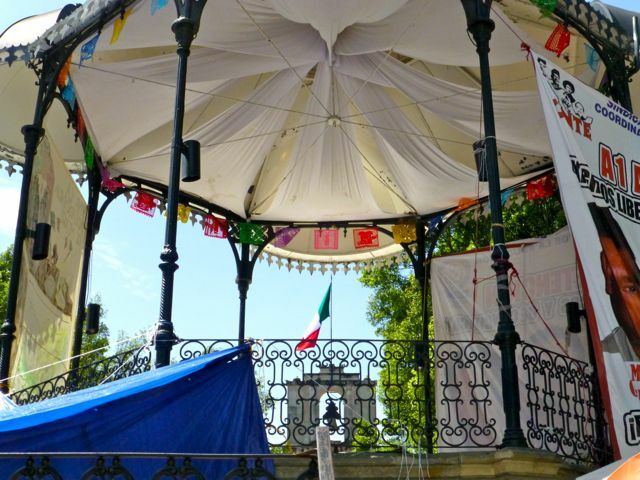 Fittingly, the streets Morelos and Matamoros run parallel and M. Bravo intersects them just a few blocks from the Municipal Building and the Plaza de la Danza. 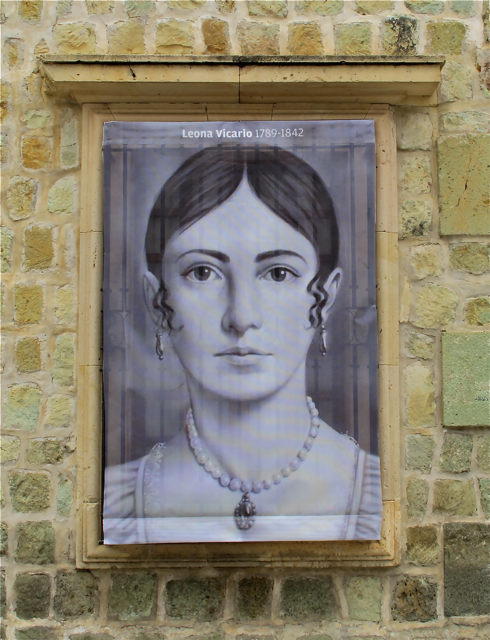 (ps) These portraits are painted directly on fine mesh screen… thus, the window bars showing through.